The Corvette Styling Cars driven by Harley Earl (L) and Bill Mitchell. Photos by David Newhardt, courtesy Mecum Auctions. Harley Earl and Bill Mitchell set the pace for design at General Motors for a combined 72 years, and under Earl’s tenure, the Chevrolet Corvette was born. Five years after his 1958 retirement, Earl was presented with a special one-off 1963 Corvette convertible “Styling Car” by GM Design, and the following year a 1964 Corvette coupe Styling Car was created for Mitchell. On Saturday, January 12, these two historically significant Corvettes will cross the auction block as a single lot, part of Mecum’s 2019 Kissimmee sale. At first glance, it’s hard to identify the year of Earl’s Corvette convertible. 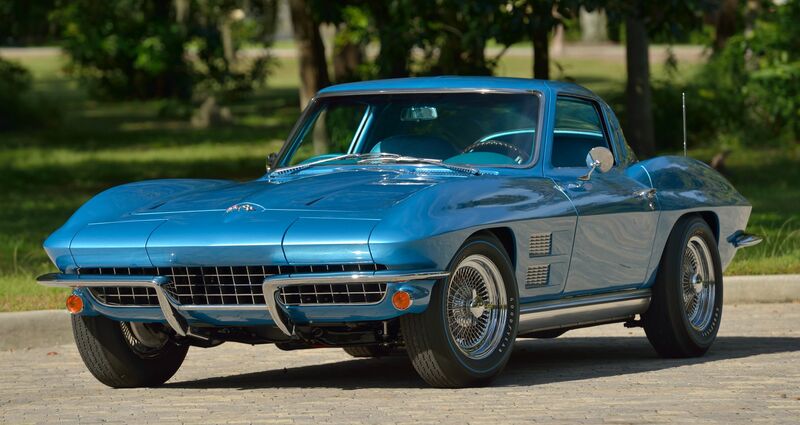 The unique sidepipes were never used on a production car, and graced just three other Corvettes, including Larry Shinoda’s 1961 Mako Shark concept, a special Corvette built for Bunkie Knudsen, and another 1963 Corvette custom – similar to Earl’s – assembled for the 1963 Chicago Auto Show. The “stinger” hood graphic wouldn’t appear on a production Corvette until 1967, and the external badging and interior control knobs appear to have been borrowed from a 1965 model. These were just a few of the custom touches added to the car. 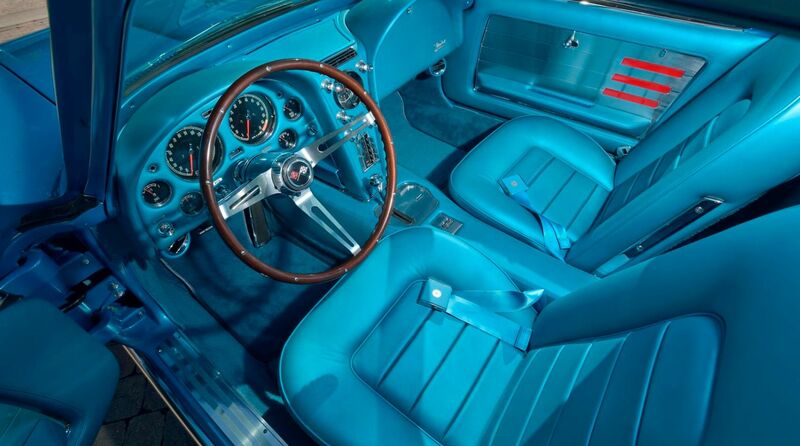 Other features included dual-circuit four-wheel disc brakes, which would appear on production Corvettes in 1965, custom blue-and-white leather seats with matching door cards, and an instrument panel that contained an altimeter, accelerometer, inside/outside temperature readings, and a vacuum gauge. Power came from a 300-horsepower version of Chevy’s 327 V-8 mated to an M20 four-speed manual transmission, and in deference to Earl’s south Florida residence, air conditioning was part of the build. Earl kept the car for just two years, driving it frequently on the streets of Palm Beach. In 1965, he served as Grand Marshal of the Daytona 500, and used the car for parade laps on the speedway’s banked oval. Later, he sold the one-of-a-kind Corvette to an Army veteran from Maryland, whose cross-country travels in the car were documented by a local newspaper. Following this, the car disappeared, resurfacing at a bankruptcy auction in 1973. The winning bidder intended to build a drag car from the Corvette, but a detailed inspection revealed that this was no ordinary production car. Further alterations were put on hold, and, in 1981, the Styling Car was purchased by Joe Clark, who began a comprehensive restoration with the help of GM Design Center staff and Corvette restoration expert Bob Gold. In the years since, it’s been named to the Bloomington Gold Great Hall (in 2011), and has crossed the auction block at least three times, most recently selling for $1.5 million in October 2013. 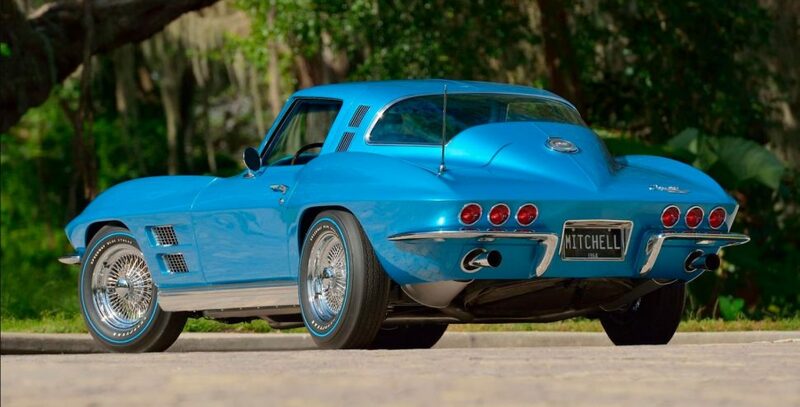 Reflecting his “less is more” design aesthetic, the Mitchell Corvette coupe Styling Car is a bit more subdued. Externally, the biggest clues to its one-off nature are the die-cast grille and matching fender vents, along with the three-taillamp-per-side rear end treatment, a popular Corvette modification in-period. Look closer, and the vent windows are missing, foreshadowing the appearance of the 1968 Corvette (and the introduction of Chevrolet’s “Astro Ventilation” across a range of models). Inside, Mitchell’s Styling Car received brushed-metal door cards, inset with a trio of lamps. 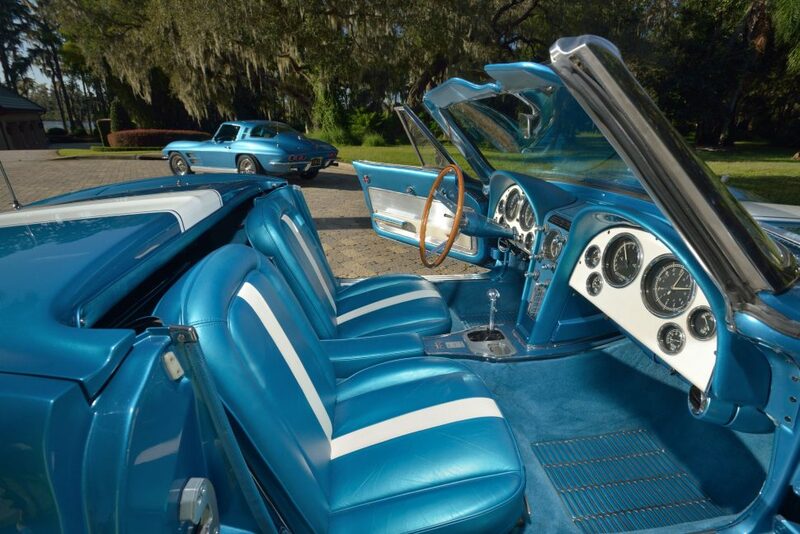 Seats were upholstered in leather dyed to match the exterior’s Metallic Blue, and the console, instrument cover, and glovebox cover were wrapped in the same material. The automatic-transmission shifter trim panel is a standard Corvette piece, but the shifter itself is modified to resemble the one used in the 1963 Buick Riviera, a car Mitchell considered to be the pinnacle of his career. 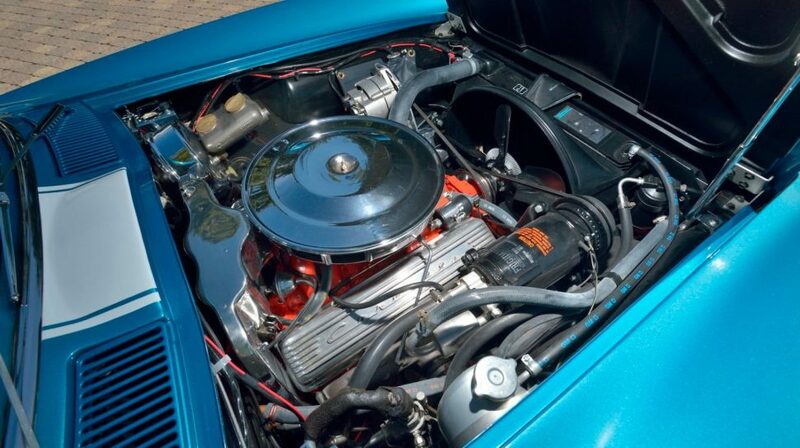 While production Corvettes ordered with automatic transmissions in 1964 received the two-speed PowerGlide, Mitchell’s car included a three-speed Hydra-Matic, which debuted on the Corvette’s option list in 1968. It isn’t precisely clear what version of the 327 V-8 sits beneath the hood of the coupe. In 1964, the most potent V-8 one could order with the PowerGlide automatic transmission was the L75, rated at 300 horsepower. 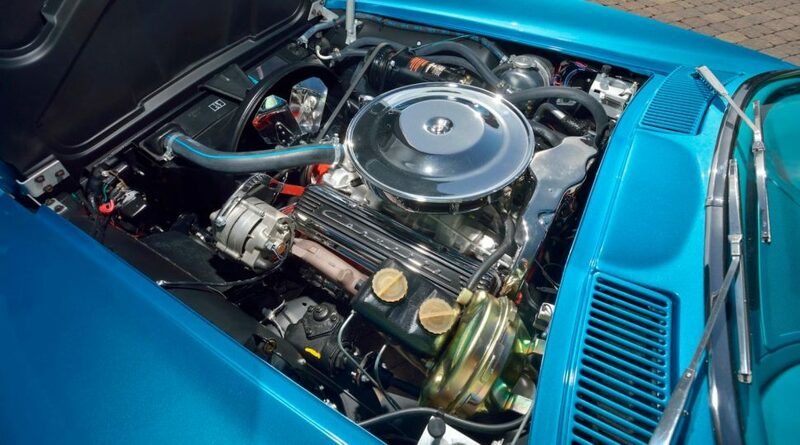 By the time the Hydra-Matic debuted in the 1968 Corvette, this automatic transmission could be bolted to a range of engines, up to and including the 400-horsepower 427. The finned valve covers would seem to indicate this wasn’t a 250- or 300-hp 327, but instead the most potent carbureted version available, rated at 365 hp. Nothing confirms this, however, as even the “365” labels are absent from the valve covers. Previously part of the Bob McDorman Collection, Mitchell’s coupe sold at auction in 2010 for $160,000. 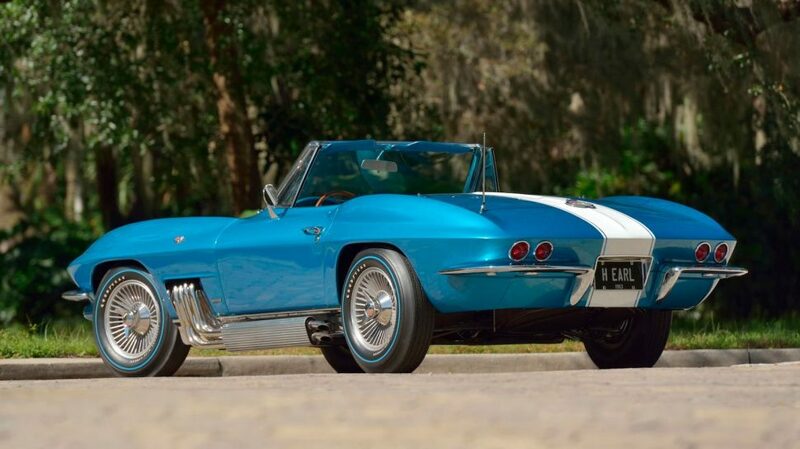 Mecum has not yet published a pre-auction estimate for the pair of Styling Car Corvettes, which will be sold together as a “Main Attraction” at the Florida sale. For further details on the Kissimmee sale, visit Mecum.com.